The Orion capsule’s arrival at the Kennedy Space Center represents a new era for NASA after the retirement of the Space Shuttle program last year. This is the first manufactured exploration-class vehicle since the Saturn V rocket, last launched over 40 years ago. Up to four astronauts will eventually be transported on long-term, deep space missions to several destinations within our solar system. It’s a common sense design that can also support backup transportation to the International Space Station and a wide range of support and scientific missions as well. “Orion ushers in a new era of space exploration beyond our home planet, enabling us to go farther than we have ever gone before,” said Robert Cabana, director at the NASA John F. Kennedy Space Center. This spacecraft was built in the same factory where the old space shuttle’s external fuel tanks were constructed, the Michoud Assembly Facility in New Orleans. 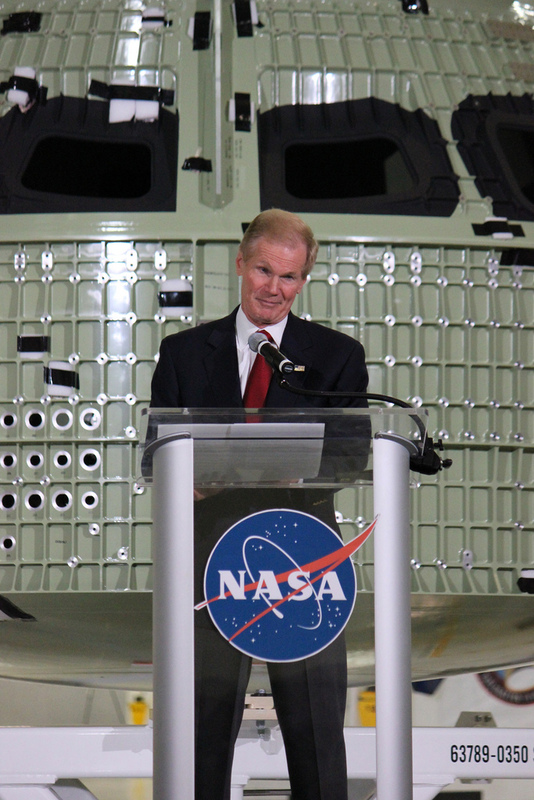 It now sits in the newly renovated Operations & Checkout Facility at KSC, used during the Apollo space program. This capsule is the primary pressure structure for housing future astronauts, built from reinforced aluminum-alloy with a lustrous surface colored seafoam green. Several windows will allow for external viewing in flight, and a large rounded corner hatch positioned on the side allows for crew members to enter and exit the vehicle. 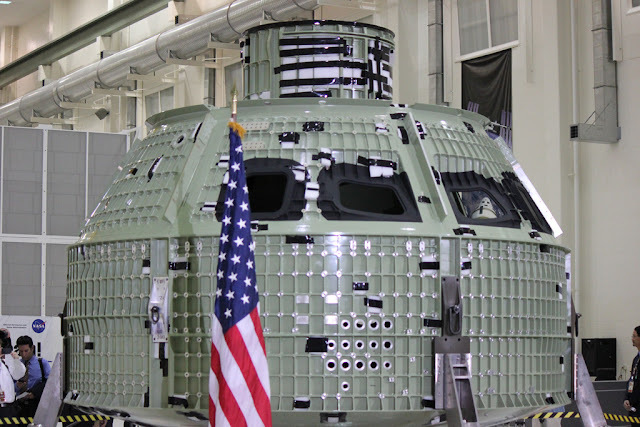 Orion’s crew module will now be assembled with a heat shield and other primary components. This will take around 16 months to complete, with tests along the way before any final launch preparations can be made. This project currently represents the latest technology available and is backed by the greatest minds in aeronautics -- NASA and Lockheed Martin. The Operations and Checkout Facility is designed to give Orion technicians on-site manufacturing with assembly line speed and overall cost effectiveness. 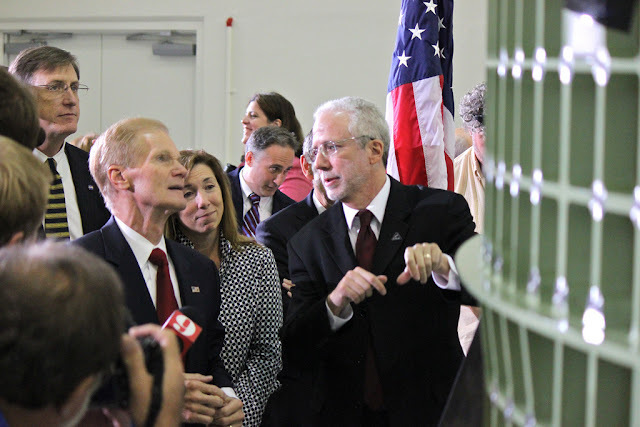 This will employ around 350 to 400 people, including some veteran space shuttle employees, in a process of build, assemble and launch that will guarantee an American return to self reliance in space exploration. Orion will be officially tested in 2014 when it is launched on Exploration Flight Test – 1. An unmanned double-orbit flight will journey to a height around 3,600 miles from earth, a distance 15 times greater than the orbit of the International Space Station. This flight will test out the environmental effects of the vacuum of space and the stress and heat experienced by atmospheric re-entry and splashdown landing. This test flight will be carried by the Delta IV Heavy rocket, but later missions into deep space will require the Space Launch System, or SLS rocket, currently under development. SLS will be NASA's advanced heavy-lift launch vehicle designed for solar exploration outside of Earth's orbit. It will carry the Orion Multi-Purpose Crew Vehicle, astronauts, important cargo, equipment and scientific experiments into deep space. This is the most ambitious and powerful rocket that will ever be developed when it is eventually launched around December 2017. The long term investment also promises to lead the way in evolution over the coming decades and take future astronauts to the Moon, asteroids, Mars, and beyond. Florida Senator Bill Nelson speaks to NASA guests about Orion.